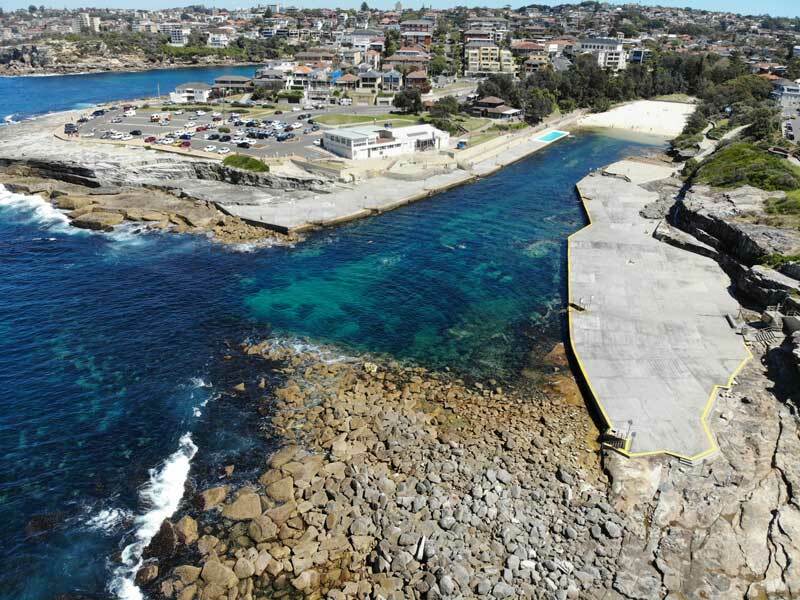 Michael McFadyen's Scuba Diving - Clovelly Pool Clovelly is located eight kilometres from the centre of Sydney, in the Eastern Suburbs. Clovelly is home to three very well known dive locations, Gordons Bay (better known as Thompsons Bay), Clovelly Pool and Shark Point. Clovelly Pool is a unique part of Sydney since it is the most protected of all of Sydney's ocean beaches. The original bay and beach was very different to how it looks now. Clovelly Bay is a long narrow bay, about 30 metres wide and 300 metres long. A very small beach at the head of the bay was very protected due to the narrowness. However, at some stage the entrance to the bay was modified by the dumping of rocks and other junk to create an extremely protected area of water (see the photograph at right). 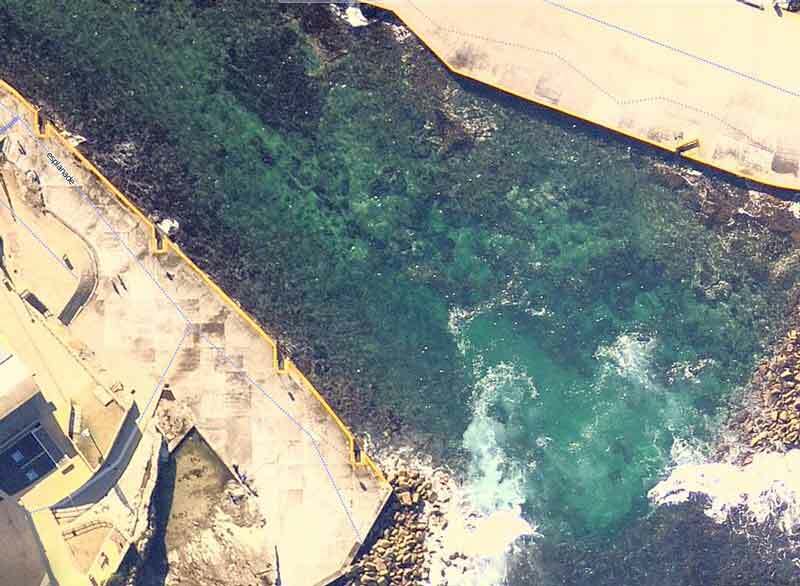 Hence its name of Clovelly Pool, although it is not a pool in the true sense of the word. The sides of the pool are totally concreted giving excellent sunbaking areas. Clovelly Pool is not diveable at certain times of the year and/or day. From 1 October till 30 April (used to be the October Long Weekend till Anzac Day), scuba divers can only enter the water of Clovelly Pool before 8 am (used to be 10 am) and after 6 pm (used to be 4 pm). This ban was put in place by Randwick City Council for a number of reasons. One was an incident in the 1970s when a diver swam under a girl and apparently pulled down her swimming costume. It was also to stop dive shops monopolising the pool's concrete surrounds and the pool itself. Believe the bans, I know at least one person who was fined for breaking the rules. Do not even consider using the steps at the ocean end to enter the water for a dive outside the pool or for returning from Shark Point if the seas are too rough to exit there. The best place to start this dive is the southern side of the pool. Come down Clovelly Road till the very end and find a parking spot as near the far left corner as possible. Note that in Summer, it can sometimes be very difficult to find a parking spot at even 7 pm for a night dive. After gearing up, walk down to the pool's edge and head for the second or third set of stairs. Be careful when going down the stairs as they can be very slippery. At high tide you can just go in off the side, but either way, be careful as the water is not too deep. Better to flop in sideways than do a giant stride. There are two dives you can do here. The first is wholly within the pool and the second is mostly outside the pool. First, the dive wholly in the pool. Once in the water, swim a few metres towards the middle of the pool and drop to the bottom. The water here is only about two to three metres deep. The bottom is mostly rocky but in the middle there is a very narrow section of sand, perhaps three or four metres wide. Head east and the water deepens to four metres and the sand widens. The depth then increases to five and six metres and the bottom is nearly all sand. The deepest part of the pool is just under six metres. Follow the edge of the sand in a anti-clockwise direction, keeping the rocks on your right. There are sometimes small moray eels in the rocks and I have even seen some small crayfish, though not since the early 1990s. On the sand there are small rays and numbfish. You will often see large schools of small trevally, yellowtail, bream, seapike and other species. You may also see whiting, Port Jackson sharks and sole. You will certainly see a number of large blue groper and morwong. I have seen an eagle ray here (eating a shellfish). Continue following the sand edge and you will come to the pool wall. This is immediately obvious as you will see that the rocks are much bigger and they go nearly all the way to the water's surface. There are also some bits of junk here, old 44 gallon (200 litre drums) and bits of steel and concrete, although at times they may be buried under the sand. Past here you will encounter a low rocky bottom. You can explore this a little before returning to the sand edge. Shortly you will be back in the area where you entered the water. Do another circumference, this time over the rocky bottom. Next time, swim right down the middle of the sand. Finish the dive at the beach end, but not too far up as it is too shallow. Exit at one of the steps. This dive is a bit too easy for most experienced divers but excellent for new divers or those needing a refresher. It is a nice night dive, and an excellent site for your first night dive. The second dive starts at the same location. Drop to the bottom and head straight towards the wall. When you get to the wall, come up and over. At high tide, you can swim over while still submerged but at low tide you will have to be on the surface. Even at middle tide you will have to take care when crossing over the rocks. Note that you will have to take care in larger seas and this dive may not be able to be done. Once over the wall, head out to sea on a bearing of 120°. After a few minutes of a bottom composed of very large rocks, you will see a small wall where the depth is eight metres and a sand patch. Past this there is a kelp bed and the depth comes back up to six metres. Here there is another more pronounced wall where the depth drops off to 10 or 11 metres. A number of overhangs are in the wall, with some very large wobbegongs and cuttlefish often seen in them. It would take at least 15 minutes from entering the water to reach this spot, swimming at a slow rate. After examining the area around this spot, follow the wall to the north-east for two or three minutes until the wall "disappears". Do a bit of a circle or triangle and head back towards the wall at say 270°. At night, keep an eye on the lights alongside the pool as you go out for an indication of the direction to head when coming back to the pool. If you do go outside the pool, be aware that on ebb tides the flow of water out over the pool wall can make it extremely difficult to return back to the pool. When you are back in the four metre depth, at night it may be wise to surface to check the correct direction to head. Submerge and cross the wall, holding onto the bottom if need be to make it easier. Once inside the pool, you can do a circuit or two to use up the rest of your air. Visibility is generally good, in the order of 10 to 15 metres. Inside the pool the viz can be 30 metres. An average day dive inside the pool, a good night dive and a good day or night dive outside the pool.